It is intended that the telemetry signals from the satellite will be receivable by most typical amateur radio stations. In addition, part of the project is to design a ground station receiver and antennas system, which will be usable by schools to receive the data. It is envisaged that this receiver would be connected to a LapTop computer, which will decode and store the telemetry data. The data will also be displayed on the compter screen as it is received. Updated – 19 Jul 2010. Howard Long, G6LVB has provided the following technical description of his recent work on the Ground Station Hardware. The design is trying to make a reasonably priced, accessible and turnkey solution. In a school, a teacher (unlike a radio amateur) doesn’t want to try to understand the nuances of having to plug-in and debug a spaghetti plate of wires into a computer. So I felt that a reasonably priced USB dongle with an antenna would make FUNcube more accessible. The dongle has three stages as shown in the first diagram. Firstly, there is the RF to Baseband down conversion. At HF, this is what a SoftRock does. For much over 30MHz, the accuracy required for the mixer and quadrature LO become more difficult to fabricate. The down conversion device used in the dongle is primarily designed for DVB-T and DAB use, but has a spec of covering 65 to 1,700MHz. It includes the oscillator, PLL, VCO and mixer all in one package. You place an antenna on one pin, program the LO to your desired frequency, and baseband comes out the other side as a differential quadrature signal. It also has a programmable low pass channel filter that will go down to a cutoff of about 2MHz. Although this seems quite wideband, bear in mind that the over sampling codec afterwards will supply further filtering. In later designs for other purposes (such as DATV), this enhanced bandwidth will be useful. The noise figure of this device without any external LNA is 4dB. The second stage is a low-priced stereo codec, namely a TI TLV320AIC3104. It’s used as an ADC only as this is a receive only function. There are cheaper units, but this one has differential inputs and thus allows to be a little more relaxed in the rest of our design when it comes to PCB layout and power supply requirements. Apart from AC coupling capacitors, the four lines (ie, differential quadrature) from the down converter go straight into the stereo differential inputs. As it is a oversampling Codec, it also provides a linear phase filter with very steep skirts appropriate for our requirements with attenuation up to a few MHz. Beyond that, the down converter’s channel filter mentioned above absolves the need for any analogue anti-aliasing filter. The USB interface is an entry-level PIC32 USB device. This is programmed to appear as a composite USB device with both a standard streaming audio device and a HID device. The HID interface allows setting of frequency for the down converter and any other configuration tasks required. The standard audio streaming is a totally standard sound card interface, so any amateur soundcard software that understands I/Q from a soundcard could be used. In addition, using standard USB class devices means that they’re free of the complication of the need to provide device specific drivers. The down converter and codec are only available as QFN packages, so aren’t great for hand soldering. I find that SchmartBoards are as good as it gets for hand soldering QFNs as they have grooves specially routed into the board. Not only that but they are also excellent for mixed signal processing: there is a solid ground plane and the facility to solder to the ground power tab underneath the QFN device. Every pin has an 0603 placement position for either a decoupling capacitor or a zero ohm link. Of course the end game is to design a small PCB to put all of this onto and put it inside a dongle. This will win no prizes for high I/Q image rejection, particularly strong in band signal performance or low phase noise. I/Q image rejection can be largely resolved in software using continuous empirical methods. The purpose of this device is to work well enough for reception of FUNcube for a reasonable cost, and hopefully this will be realised! In the future, using better (and more expensive!) codecs, extended passbands can be made. At standard USB full speed, two channel 192kHz in general is the highest speed that is commonly available giving a 192kHz bandwidth, although the nature of the anti-aliasing filters on these higher audio bandwidth devices is such that the skirts make a true 192kHz RF passband unrealisable. Beyond this USB 2.0 high-speed interfaces need to be used, and inexpensive audio codecs are no longer available. An alternative is to use non-audio high sample rate ADCs, and plenty of these are available albeit at a higher price than audio codecs. To create a high speed USB interface will almost certainly mean an ASIC or FPGA design and some proprietary drivers. 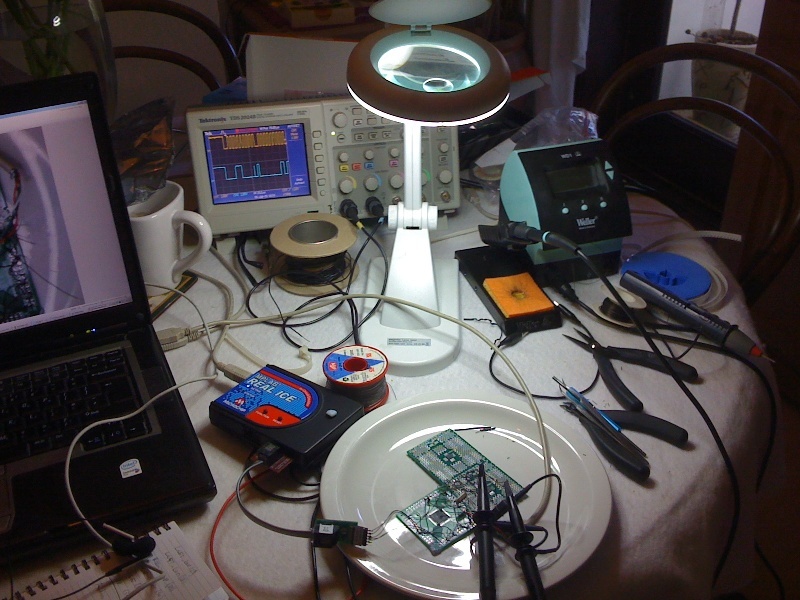 The use of dinner plates is common when using one’s mobile lab as any self-respecting out-and-about SMD practitioner will know! It’s just in case any of those 0402 SMD parts slip out of the tweezers: have you ever tried finding those pesky parts in your carpet? I still lost three anyway yesterday as it was.